Be the first to share your favorite memory, photo or story of Chester "Chet". This memorial page is dedicated for family, friends and future generations to celebrate the life of their loved one. Chester “Chet” L Stevens Jr 91 of Boyd, WI. passed away Thursday, March 21st, 2019 at Oakbrook Health and Rehab in Thorp, WI. He was born in Spring Grove Illinois Feb 7, 1928 to Chester L and Francis A (Thompson) Stevens. Chet spent his early years on the Fox and Mississippi rivers hunting ducks and pheasants with his dogs, and working on the family dairy farm. Chet loved his hunting dogs and enjoyed training them to hunt with him. He was also a big Chicago White Sox baseball fan and spent many afternoons at the ball park. He got to know old time professional ball players Billy Klaus, who came to the farm to hunt ducks, and Chuck Hiller. Chet graduated from Richmond High School in 1946. He entered the Army in January 1951 and was stationed in Fort Bragg, North Carolina. He was discharged in January 1953. He then worked at the Morton Chemical Co from 1953 until taking over the family farm in 1956. In 1969 the farm was taken over by the State of Illinois and is now part of the Chain O Lakes State Park. Chet moved to Boyd in November 1970 and began dairy farming south of Boyd. In June 1978 he married Ann Eslinger and in doing so, inherited an instant family complete with kids, in-laws and grandkids. Chet and Ann continued dairy farming until 1990, then started raising Hereford cattle until 2012. During this time, Chet had the opportunity to travel back to his home farm (now a state park) with Tom and Denny McQuillan, with a stop at the new Brewers stadium for a game. He looked forward to heading into Boyd in the morning after chores to meet the guys for coffee and to catch up with what was going on. Coming from Illinois, Chet liked to cheer for da Bears. Many a dollar was bet on the “big game”. He usually cheered on any team playing the Packers, and loved picking on any Packer fans. He and Lois Meyer kept a friendly rivalry going for many years. Chet brought his love of water to Wisconsin, and in the early 80’s, with the help of Ann’s brother, Jerome Sonnentag, dug the ponds on the farm and stocked them with fish. He loved to watch all the different ducks fly in and out throughout the year. Many hours were spent on the pond fishing with his good neighbor and friend, Jim Cooley. In the early 90’s Chet had an idea that he wanted a cabin up in the woods overlooking the ponds. With the help of Jim Kowalcyzk and Don Gilles and a couple of chain saws, the cabin was built. The ponds and cabin became the sight of many fishing contests and family picnics. Chet enjoyed many duck hunting trips with his frequent hunting partner Tab Etten. They took many trips to the Mississippi river at Alma for 16 years until 1988, bringing back many ducks for Ann to cook up. From 1980 until 2008, Chet & Ann hosted a huge family reunion and picnic at the farm. Lots of food, fun, family and most important, the softball game. Everyone from the youngest to the oldest took their turn at bat, and any ball hit into the manure pit was an automatic out. Chet was always one of the starting pitchers, tossing in the big pumpkin ball to the hitters, and making the throw to first for the out. Visiting with Chet always brought about stories of “down home” in Illinois. Whether it was about duck hunting, his dogs or his friends, Chet always had a big smile on his face. He especially liked to tell about John Henry, a former slave that Chet’s mom and dad brought into their home. Chet fondly remembered John Henry as just another member of the family. In 2017, Jim May, an old family friend and nationally renowned author, sat down and visited with Chet, reminiscing about the good old days. In 2018, the story of Jim and Chet’s visit was featured in the Stanley Republican. Chet is survived by his wife, Ann, of 40 years, step children Debbie (Thomas) Peterson, Gary (Bonnie) Eslinger, Pegi Eslinger and Kris (Steven) Bremness. He is also survived by 8 step grandchildren and 7 step great grandchildren, along with numerous nieces and nephews. He is preceded in death by his parents, brothers Bert, Frank (Dorothy) and Robert (Bonnie) Stevens, and sisters Lucy (Earl) Harrison and Edith (Willis) Stanek. 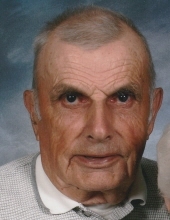 A visitation will be held on Saturday, March 30 from 9:30 a.m. - 12:30 p.m. with a service of Christian burial at 12:30 p.m. with Deacon Ned Willkom officiating at Leiser Funeral Home in Cadott. Inurnment will be at St Joseph’s cemetery at a later date. To send flowers or a remembrance gift to the family of Chester "Chet" L. Stevens, please visit our Tribute Store. "Email Address" would like to share the life celebration of Chester "Chet" L. Stevens. Click on the "link" to go to share a favorite memory or leave a condolence message for the family.